And luckily I’m able to easily provide this handy cleaning tool for myself. As a bonus they’re much larger and thicker than the wimpy ones I used to buy. 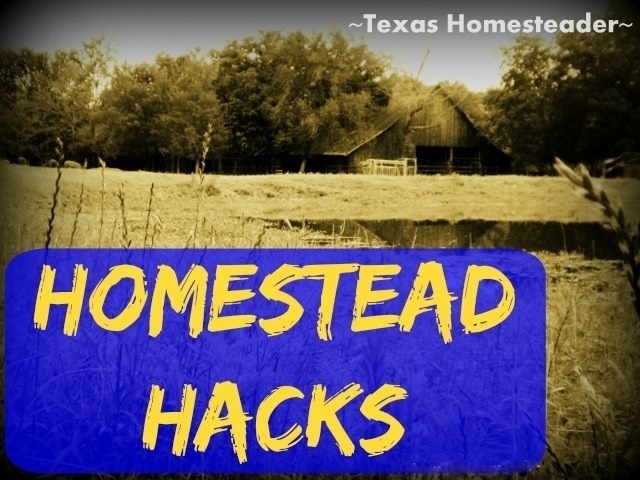 Check out today’s Homestead Hack, y’all! Have you ever heard of finger crochet? Me neither, did I just make that up?? Although I’d never heard of it before a reader told me they did finger crochet in elementary school. DARN, there goes another original million-dollar idea destined to make me filthy rich! I used to do some light crocheting when I was in junior high although back then I used crochet hooks. But I remember nothing but the most basic stitches. So this post is certainly not a tutorial for crochet (and you’re WELCOME) I’m just giving you a quick craft idea & I’m assuming you already know the basic stitches. But c’mon, it’s just a scrubbie – perfection doesn’t even matter here anyway! In no time you can whip one of these up for yourself. 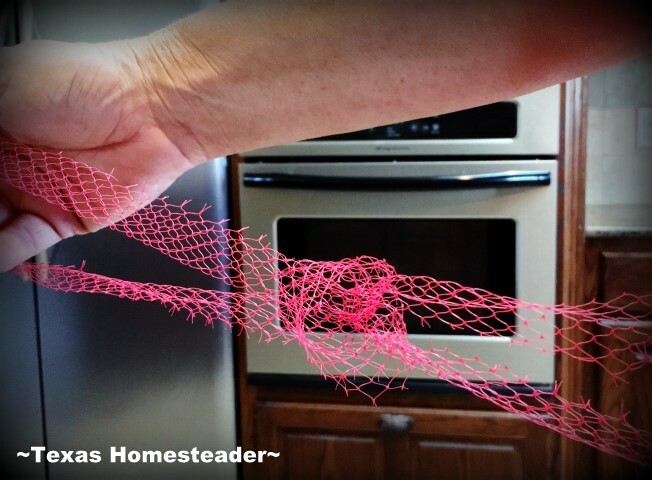 First I saved several mesh produce bags. I cut off the sewn-paper/plastic advertising part at the top and the metal ring at the bottom. Now I’m left with a mesh sleeve about 21″ long. I cut each sleeve by 1/4, making 4 rings about 5″ to 5.5″ wide. Then I stretched the rings out & quickly joined them together into one long mesh rope. I did this by looping one ring through a second ring and then looping the first back through itself. (clear as mud?? LOL) Although it’s hard to describe, it’s easy to do. Remember when you were a kid and thought it would be funny to join all the rubber bands into one big rubber band & stuff it all back in your father’s desk? No? Just me?? OK well anyway you’ll join these together in the same way children whom shall remain nameless would join together a bunch of rubber bands. When I had a large thick rope of mesh I crocheted the rope into a round pad. Now the first one I made I tried using a rug hook since I knew a crochet hook would be too small. What madness! The rug hook kept getting hung up into the mesh. I figured it would be much easier to just crochet by hand and you know what? IT WAS! The loops are big enough that I can easily use my fingers instead. So using basic stitches I finger-crocheted that mesh into a large pot scrubber of my own requirements. Now THIS bad boy does the trick! This entry was posted in Blog Posts and tagged Environment, Frugality, Homestead Hacks, Make-It-Yourself on September 28, 2016 by Texas Homesteader. Such a great idea!! Thank you for sharing with as at the To Grandma’s house we go link party, you will be featured in the new party starting tomorrow, hope to see you there! What a great idea! Next time I buy a bag of fruit, I’ll have to try this! You’re my neighbor in Rosilind’s Christian Blogger’s Linkup! Have a Lovely Day! You are so crafty! I never would have thought to do this and it’s such a great idea! Thanks so much for sharing with us at Share The Wealth Sunday! Such a great way to repurpose something into something else that is so useful! Thank you so much for sharing with us at Dishing It & Digging It! I love repurposed crafts and this one is genius! 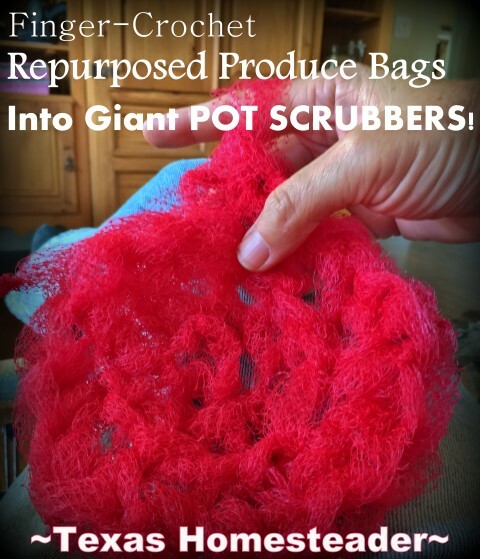 I could use a giant pot scrubber for sure! Thanks for sharing your awesome project with us at Merry Monday this week! Wow! That’s a neat idea! Thanks for sharing on the Family Joy Link Up. This is a very cool idea. I bet it works great. Thanks for sharing on the Waste Less Wednesday Hop! You are too funny Taylor. But not the only one who destroys your kitchen. haha. This is a really great repurpose of those mesh bags. And we always want to be environmentally friendly so you have my vote of confidence on that one. As long as it works right? And it is a very pretty color to boot! Pinning your great idea. How clever. crochet! That leaves me out. I roll up the net bags, tie with a string in the middle and that’s my cheap scrubby :} Normally I use them for storing onions, small toys, basketball and or football and then hang up out of the way; etc. This. Is. Brilliant. What a great idea! Thank you, Tammy! I have seen these at craft sales and always wanted to learn to make my own. Hi Tammy! Stopping by from the Homestead Blog Hop. Love this idea, and very clever of you to “crochet” with your fingers. It reminds me of arm knitting. 🙂 I use old mesh bags in kind of the same way. If I have something really messy and don’t want to ruin my regular scrubber, I just take an bag and scrunch it up in my hand and scrub with it. It’s great for cheese and for greasy roasting pans. Then I can just toss it in the trash. Pinning this post!